Ecolise > NEWS > ECOLISE news > The GROW Observatory needs your help! The GROW Observatory needs your help! (16 January 2017) – The GROW Observatory invites you to take part in a 15 minute survey to help inform how it develops. It is a short questionnaire that was put together to make sure that the project reflects and represents the needs, wants and desires of a variety of growers across Europe. 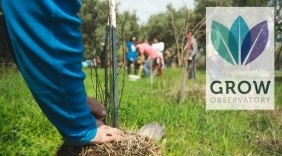 The GROW Observatory is going to be putting together citizen science experiments, online learning and collaboration opportunities, distributing soil moisture sensors to growers and establishing a Europe-wide citizen observatory and network of growers. This survey is the first step in putting the project together. There will be many future opportunities to be more involved in the project, make it relevant to your communities and to take an active part in experiments and other exciting aspects of our soils. The GROW Observatory is an EU funded project that aims to underpin smart and sustainable custodianship of land and soil, whilst meeting the demands of future food production.